By sharing one of the longest land borders in the world, the United States and Mexico will always have a special relationship. In the early twenty-first century, they are as important to one another as ever before with a vital trade partnership and often-tense migration positions. The ideal introduction to U.S.-Mexican relations, this book moves from conflicts all through the nineteenth century up to contemporary democratic elections in Mexico. Domínguez and Fernández de Castro deftly trace the path of the relationship between these North American neighbors from bloody conflicts to (wary) partnership. By covering immigration, drug trafficking, NAFTA, democracy, environmental problems, and economic instability, the second edition of The United States and Mexico provides a thorough look back and an informed vision of the future. 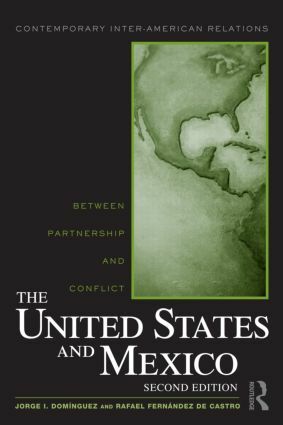 "In this revised edition, two seasoned and astute analysts concisely illuminate the history, dynamics, and prospects of perhaps the most important international relationship for the United States, that with neighboring Mexico. Their new preface and epilogue explore the impacts of the U.S. response to the 9/11 attacks, the international reaction to the unilateral displays of U.S. power that followed, and the rise of China’s economy and influence. They examine the complex interplay of domestic and international political and economic forces on both sides of the border that makes this unique relationship so difficult, but vital, to manage." "This compact but comprehensive book explains both the profound transformation in U.S.–Mexican relations in the past two decades and the enduring asymmetry that makes a genuine partnership so difficult. With great skill and an encyclopedia of knowledge, Domínguez and Fernández de Castro distill the essential features of the relationship into a book that all North Americans should read." "This book is by far the best available study of Mexico–U.S. relations. Although Domínguez and Fernández de Castro are sensitive to the specific historical characteristics of the bilateral relationship, they consistently place their subject in a broader international context. They address topics ranging from the impact of NAFTA to the complex policy issues that challenge government officials in both Mexico and the United States. The analysis is sharp and the writing is clear, making the book ideally suited for classroom use." Jorge I. Domínguez is the Antonio Madero Professor of Mexican and Latin American Politics and Economics and Vice Provost for International Affairs at Harvard University. He is a past president of the Latin American Studies Association. Rafael Fernández de Castro has been Chair, Founder, and Full-time Professor, Department of International Studies, Instituto Tecnológico Autónomo de México (ITAM), Mexico City, since 1991. He is currently on leave to work as President Felipe Calderón’s Foreign Policy Advisor.